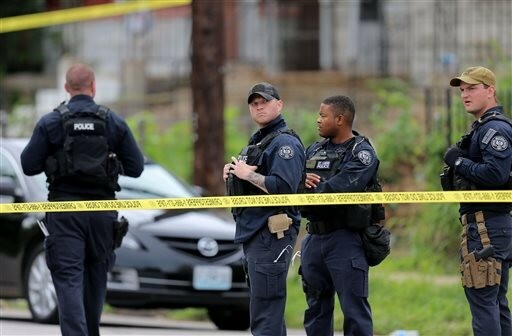 ST. LOUIS (AP) — An armed man fleeing from officers serving a search warrant at a home in a crime-troubled section of St. Louis was shot and killed Wednesday by police after he pointed a gun at them, the city&apos;s police chief said. 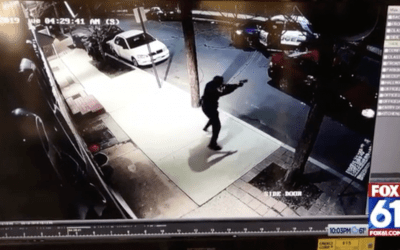 The shooting that left a black suspect dead drew protests, with many of the roughly 150 people who gathered at the scene hurling obscene gestures and expletives at investigators and questioning the police use of deadly force. Some chanted "Black Lives Matter," a mantra used a year ago after the police shooting death of 18-year-old Michael Brown in nearby Ferguson. St. Louis Police Chief Sam Dotson said two suspects fled from the home about noon Wednesday on the city&apos;s north side before one of the men turned and pointed a handgun at the officers, who shot the man. That suspect, described by Dotson as being in his early 20s, died at the scene. Authorities were searching for the second suspect. No officers were injured. Their races were not disclosed. Dotson said four guns, including the handgun wielded by the dead suspect, and crack cocaine were recovered at or near the home, which last year yielded illegal guns during a police search. Another man and a woman who were also inside the home were arrested, Dotson said. Police obtained the search warrant because they believed the home harbored suspects in other crimes, Dotson said. Dotson didn&apos;t specify which crimes, but he noted that a killing happened on the same street Monday and a nearby market just was riddled by bullets. That area also is near where a 93-year-old veteran who was part of the Tuskegee Airmen — black World War II pilots — was the victim of crimes twice within a few minutes Sunday, being robbed and then having his car stolen. The veteran was unhurt, and his car was found Tuesday blocks from where it was taken. Many of those who gathered near Wednesday&apos;s shooting voiced anger at police. As police removed their yellow tape that cordoned off the scene, dozens of people converged on the home&apos;s front yard, many chanting insults and gesturing obscenely at officers. Several onlookers surrounded individual officers, yelling at them. "Another youth down by the hands of police," Dex Dockett, 42, who lives nearby, told a reporter. "What could have been done different to de-escalate rather than escalate? They (police) come in with an us-against-them mentality. You&apos;ve got to have the right kind of cops to engage in these types of neighborhoods." Another neighborhood resident, Fred Price, skeptical about Dotson&apos;s account that the suspect pointed a gun at officers before being mortally wounded. "They provoked the situation," Price, 33, said. "Situations like this make us want to keep the police out of the neighborhood. They&apos;re shooting first, then asking questions." Some of those who gathered had spent the morning in downtown St. Louis, marching to mark the anniversary of the fatal police shooting of Kajieme Powell. He was fatally shot by two St. Louis officers after police said he came at them with a knife. Circuit Attorney Jennifer Joyce is still reviewing the case to determine whether lethal force was justified. 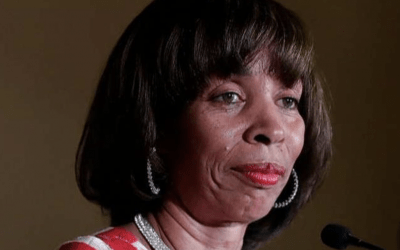 Tensions also remain high after unrest during the anniversary of Brown&apos;s death. Brown, who was black and unarmed, was fatally shot by Ferguson officer Darren Wilson on Aug. 9, 2014. A St. Louis County grand jury and the U.S. Justice Department declined to charge Wilson, who resigned in November. Associated Press reporter Jim Suhr contributed to this report.